So, if you saw my how-to-reverse video post (https://digicompdiy.wordpress.com/2010/02/07/how-to-reverse-footage-in-premiere/), then you noticed how the text appears to be typewritten in a way (one letter appearing at a time.) Well, this is one way in which you can accomplish that and it’s rather simple. 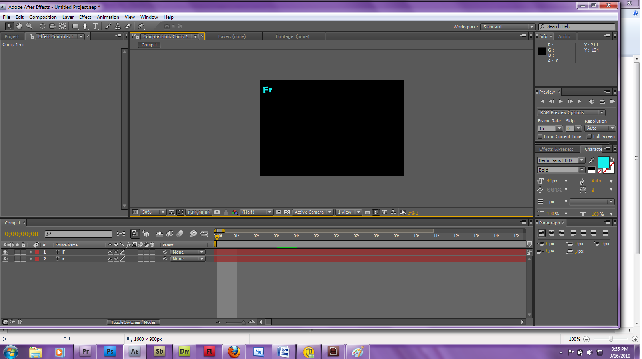 First off, create a new composition in AfterEffects. Now, create a new text layer (layer, new, text.) Then type the first letter of what you want to have typewritten. Okay, now repeat that step (you will from here on out) and type your second letter. Make sure your letters are in order (move the newest layer to the bottom.) The example image is below. Note: A quick way to create a new text layer is to click on the select tool (if you’re on a current text layer), then click on the text tool and then click anywhere on the comp..this will automatically create a new text layer. Also: Make sure you line up your individual letters (select move tool and move where you want.) Yes, it takes a lot of time and is a pain, but it’s worth it when you see your awesome typewritten text. Okay, now you’re going to go to your timeline, expand it so as you can see the entire comp (timewise). 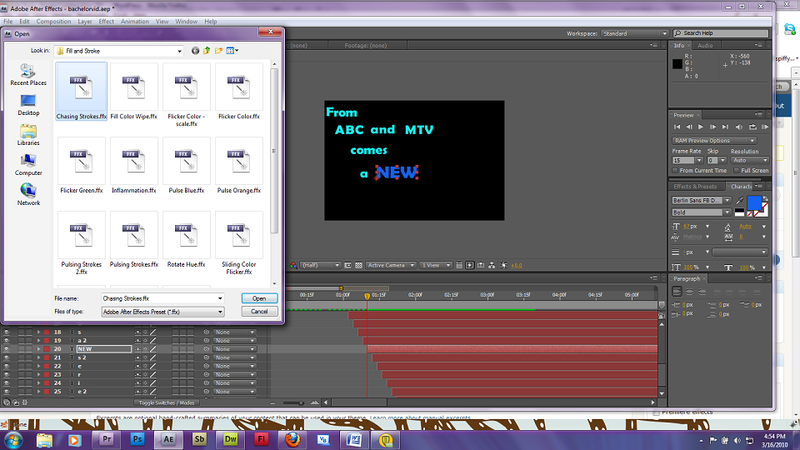 Now, you’re going to drag the second letter’s timeline in about 2 frames. Example is below. Again, make sure that you have put the layers in the right order, otherwise this effect will not work. Okay, now to spice it up a bit. Let’s add a text effect to a letter (or full word in my case). Note: The word “NEW” in my example does not have the typewritten effect on it, this is the only word that does not. Choose your letter or word. Place the playhead over where you want the animation to begin (example, I wanted it to start right when the word “NEW” appears, so I placed my playhead right where that layer showed up.) The below example shows what I’m talking about here on the lower right hand side of the image. Now go to Animation, Apply New Animation Preset (as we have before in our previous AfterEffects tutorial). You should be in the text folder automatically, but if not, be sure to click on text. Now, pick whatever animation appeals to you. I chose the chasing stroke. Alright, well that about wraps up this tutorial. Be sure to click here and click on Digital Composition, then How-To Blogs and look at DIY Blog 11.! ~ by Tiffany N on March 16, 2010.